We cooked Szechan-style "Fiery" Pot (火鍋) with our donabe tonight. Since I saved the pork stock I made the other day in the freezer, I used it as the base for the broth, but you can use the Chinese-style chicken stock, too. Here's my recipe. To cook the soup, in a small pan, saute the first 5 ingredients in the sesame oil at a medium heat for 1 minute. Add the tobanjan and continue to cook for another minute. Add 1/4C of Chinese rice wine and stir. Transfer the mixture to the donabe (clay pot) and add the stock. Season with salt. Add the scallions (green parts). To make the pork meatballs, mix all the ingredients for the meat balls and knead until sticky. 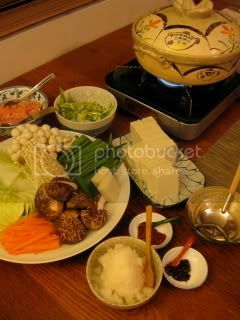 To enjoy the hot pot, bring the soup to boil, cook the ingredients of your choice at the table. You can serve the cooked ingredients and soup with your choice of condiments, such as sliced scallion, hot paste, shichimi, etc. Or, you can dip the cooked ingredients in the raw egg (like sukiyaki-style). At the end of the meal, cook the Chinese noodle in the remaining soup and enjoy!